Podcast Episode 103: Does Jupiter Support Young-Earth Creationism? Young-Earth creationism! Jupiter! What else do you need for a fun episode? (Other than an engaging host?) I had not planned on doing this episode, and I realize that it’s a day late. Why? Because I was going to do an episode entitled, “ε, Newton, Einstein, and Schrödinger.” And I had it mostly written. And then I looked back at episode 64 on quantum nonsense and realized that everything I was going to put in this new episode had already been done as the last section of the main segment in that episode. This was realized at about 6PM last night. So, I quickly dug up an older blog post and converted it to an episode, had to go to sleep, woke up to the roofers (new roof due to flood damage), and got to record tonight). Here ’tis. Take a tetrahedron (4-sided solid made of four equilateral triangles) and put it in a sphere such that each point of the pyramid touches the inside surface of the sphere. Draw a straight line through the center of the sphere such that one end of the line intersects a point of the pyramid; think of this line as the polar axis, and now orient it in your mind so that the line that goes through the pyramid point is down. Now draw a line around the circle’s equator. 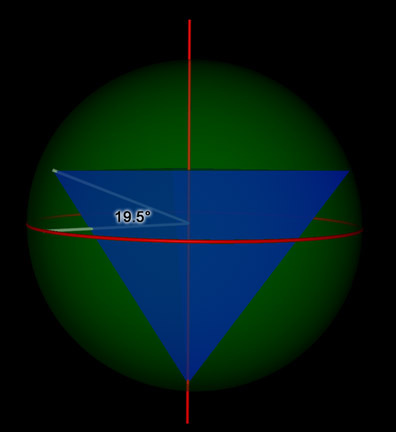 Now, if you take the angle between the equator, the center of the sphere, and one of the three non-pole points of the pyramid, you get 19.5°. That’s the magic of Richard C. Hoagland’s hyperbolic geometry and all the claims of importance for the 19.5° latitude that I’m going to explore in this post. Richard C. Hoagland says a lot of stuff. Almost everything he says sounds crazy. Over the decades, he has built up a vast conspiracy-laden mythology about the universe, how it supposedly works, and why things are the way they are. To go into every single one of his claims, as I’ve said before in other posts about Hoagland (like here, here, or here), would be next to impossible. As in previous posts, the point in this is to go over a very specific claim. The “19.5° is an important number” stems from his whole “hyperdimensional physics” mythos. Again, something I’m not going to go into. Partly because it’s incomprehensible, nonsensical, and made up. Suffice to say, “A tenet of these views holds that vast amounts of energy originating from dimensions we cannot perceive are available at latitudes 19.5° both south and north on the Sun and every planet in the solar system” (quote source). In other words, Hoagland and fellow believers claim that it is at 19.5° latitude on every body in the solar system that we have the biggest/bestest/scarriest/craziest/powerfulest/whateverest feature. Let’s take a look, shall we? Taken from Hoagland’s own website, we have a short list proving that everything of importance in the solar system is at 19.5° latitude. Note that everything in this table is directly copied from his website except for the comments, which I have simplified/shortened/clarified. *Hoagland calls this “Neptune Great Red Spot” but it has, since it was observed by Voyager 2 in 1989, disappeared. Since Hoagland posted this (his page is ©1989), many other people have found other things on other planets that they claim enhances this idea. One such site, for example, indicates that the Pyramid of the Sun is at 19.6° N (on Earth). Other people claim, such as Will Hart, that all solar storms and susnspots originate from 19.5° latitude on the sun; another twist from this site about the sun is “sunspot activity and the region of peak temperatures is limited to 19.5 degreees north and south.” Others remark simply, “It is interesting how most planets in our solar system display phenomena at this latitude.” The list of claims goes on. Dissecting the List, and Are These Features Important? One of the first things you should notice from Hoagland’s list is that only one of the 9 things I pulled (the ones I didn’t are on Jupiter’s moon Io) is at 19.5°. Two more are within 0.1° of it. For a precise geometric phenomenon where huge amounts of energy are released, this isn’t very precise. On Earth, Mauna Loa, Hawai’i, with a summit at 19.48° is a correct claim of the largest shield volcano presently on the planet. However, it’s really not that spectacular a volcano in terms of energetic potential. The Yellowstone caldera is about 34×45 miles (55×72 km) across. That’s just the caldera. It is at a latitude 44.4° N. The most recent known supervolcano eruption on Earth was in Lake Taupo, about 26,500 years ago, and its latitude is 38.82° S.
Additionally, the largest earthquakes – more releases of energy – since 1900 haven’t been anywhere near 19.5°. None of them. As for structures on the Earth to harness this energy, one might consider the Pyramid of the Sun and say, “wow, that’s pretty neat that it’s at 19.5°.” But what about Egypt’s pyramids? Or South America’s? What about other architecture, say, Stonehenge? None of these are near 19.5°. This is what we call “cherry picking” to an extreme. If we want to expand the notion of cherry picking, let’s go to the moon. Hoagland has found some random feature at 19.5° … err, 19.6° … latitude on the far side that has something to do with a volcanic feature. Except that the moon is covered in volcanic features. 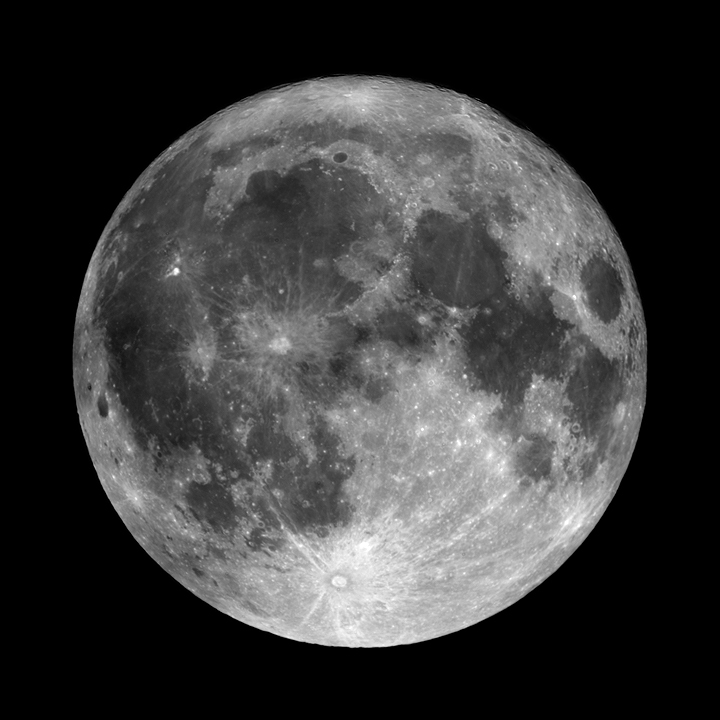 When you look at the moon, all those dark splotches on the near side are vast volcanic areas where ancient impacts allowed magma from deep below the crust to breach the surface and fill them. And these seas of volcanic material — maria (plural) — are not in any way centered around 19.5°. Nor are the smaller volcanic features that we observe today still strewn throughout them. Or there’s Mars. Hoagland and his ilk claim that the vast Olympus Mons volcano – the tallest volcano in the solar system – is centered at 19.3° on Mars and is perfect evidence for this hyperbolic geometry. Except that it’s not. The caldera complex of Olympus Mons (there are at least 6 distinct calderas at the summit) range between latitudes 17.8° and 18.8° North. In addition to that, Olympus Mons is so vast with a diameter of around 650 km that the northern scarps start at around 23.5° N while the southern margin is around 13.5° N latitude. So with it spanning over 10°, it’s not that hard to hit it. Besides, Mars has 23 other major volcanoes, and Alba Patera, which is actually the most voluminous volcano in the solar system (as Mauna Loa is the most voluminous volcano on Earth), has a caldera centered at 40.3° N.
The claim of the sun having sunspots centered at 19.5° is also wrong, as can be seen on any given day. We can also look at other features of interest. I’ll name only one for brevity since I think I’ve made my point by now. Saturn’s moon Enceladus was, in the last few years, shown to have active geysers spewing material from the interior of the moon. What’s their latitude? About 90° S — that’s right, the south pole. Not anywhere near 19.5° North nor South latitude. This particular magical belief is only supported by very very careful cherry-picking. As clearly shown above, even in the features that these people claim shows 19.5° is special, more than half the time they’re just wrong, off the mark, or are being very generous with reporting their numbers. And still the features that are “correct” are not especially unique. I don’t really think much else needs to be said on this topic. It’s just made up and features are found to fit it while ignoring everything else. Today I had a happy occurrence – Phil Plait mentioned me in his “Bad Astronomy” blog in the context of my previous post on this subject. As a consequence, my blog received over a 5-fold increase in hits. Thanks, Phil, and thanks to all of you who came here from the BA blog. The purpose of this particular post is a follow-up on that first one. In the first one, I wrote that the video sample on the CreationAstronomy.com blog is approximately 13 minutes long. However, I was only able to view about 4 minutes of it for free from the website. Well, one of the readers of my post sent me a link to download the full section of the video. So, without further ado, let’s examine the claims in the next 9 minutes of the video. This is simply not true, and at its nicest level is taking statements out of context and sorely downplaying the status of solar system formation modeling. I address this quite a bit in my first post in this 2-part series. The other aspect of this claim that deserves to be addressed is the very common “god of the gaps” logical fallacy: “We don’t know how this happened, therefore God did it.” Among the skeptical community, this often is compressed into the single word, “goddidit,” because we hear it so often from Creationists. 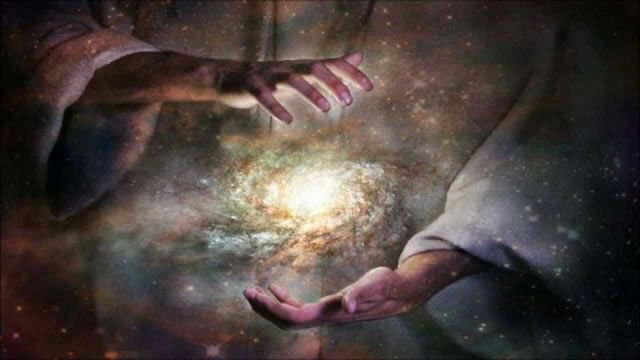 The basic fallacy here is that you confuse something that we don’t currently know with something that we can’t possibly know, and therefore it is only explainable through the miracles that a divine creator can make. Ganymede’s magnetic field is interesting. But, as I stated in my first post about this CreationAstronomy.com site, that’s what makes astronomers happy! We like it when we find something that we can’t immediately explain. If nothing else, that means Job Security! But on a more explanatory level, the theory for the formation of a magnetic field on a planetary scale is that it requires a molten interior, but Ganymede shouldn’t have one by this point in its life because it should have cooled. On that point, Psarris is correct. But, what does this mean, then, for an explanation? It means that we need to explain how Ganymede’s core could have either remained warm until at least 1 billion years ago or was heated up until about 1 billion years ago (since a remnant field can still exist for ~1 billion years even without something actively driving it). What modelers have come up with is that the main jovian satellites were not always in their current orbits, but that they slowly migrated into them. This migration passed through resonances until it got to its current resonance of 1:2:4 (Io, Europa, Ganymede … Callisto isn’t really in a resonance (yet)). Getting into this resonance caused enough tidal heating to create a dynamo in Ganymede’s core. In other words, there’s a perfectly reasonable dynamical model that explains this without resorting to goddidit. What this implies, however, are a few different things. One idea is that the main impactor population of Callisto – possibly comets – simply lacks a small size population (impactors a few 10s to 100s of meters). Personally, I don’t find that explanation incredibly convincing from my own research in craters, however. Another possible explanation (Bierhaus et al. (2000) “Small Crater Populations on Callisto”) is that it is simply a resolution issue, and that when viewed under higher resolution, previously indiscernible small craters become evident. There are also other possible explanations here, but my main point is one that I’ve been stressing when dealing with this CreationAstronomy.com website: A lack of conforming to known, simpler models is something that astronomers – and scientists in general – like, because it means that they then get to go and figure out a new model to explain the new results. 2.c. Europa -> Liquid Water -> Life? This claim is one that I’ve addressed before, namely in my post, NASA’s “Follow the Water,” Ice Detected by Phoenix on Mars, and Noah’s Flood. It’s one of my older posts so not as well organized, but the basic idea is that all life that we know of needs liquid water to live. Therefore, the first step in attempting to find life is to find places where liquid water is. It’s that simple. This is another claim that I have addressed, in-depth, before. The post is, Dating Planetary Surfaces with Craters – Why There Is No “Crisis in Crater Count Dating”. Psarris’ claim really is identical to this ICR article. The basic response boils down to: Astronomers know of the issue. And we take it into account. It’s another of the classic creationist tactics where they will give you a problem with “evolutionary” science and then say it invalidates everything about science, but they don’t tell you that we already know about the issue and take it into account. Says who? I have not heard nor seen this claim before, and I took a graduate class from the guy who literally wrote the book on Jupiter’s moons. If Psarris would like to show his calculations, I will gladly look over them and get back to this claim. While the basic idea behind this claim is not new, I have never seen it before raised as an issue. Planetary crust is recycled. Stuff coming out of volcanoes on Earth now used to be buried miles beneath the surface which used to be on the surface. I’m sorry, but I honestly don’t see the issue here with this claim. First, I just love it when articles say that scientists are “flabbergasted,” “surprised,” “shocked,” “astounded,” “puzzled,” “clueless,” “can’t understand,” “unbelieving,” “amazed,” “bewildered,” “baffled,” and other such phrases. (Okay, more honestly, I really don’t like it.) Seriously, we’re apparently the people who are supposed to know everything and so it’s like a “gotcha” game when there’s a discovery that “surprises” us. Need I repeat it? THAT’S THE POINT OF SCIENCE — TO FIND OUT NEW THINGS! Alright, deep breath … now, what about the temperatures of Io’s volcanoes. Again, I do not know of why this is particularly an issue. If Psarris would like to show his math – or show someone else’s as to why magma cannot be heated to 3000° on Io, I will take a look at it. But this is another case where I do not particularly want to do his work for him to then add more work to my own plate. I’ll start off by saying that I threw this post together rather quickly (if “quickly” can mean an hour of writing and looking things up and watching the video segment), so I apologize if I seem a little flippant at the end, brushing off his claims. However, my point really is the same: If he is going to make the claim, he needs to back it up. You can’t just state something and leave it at that and expect people to bend over backwards to flesh out your own claim and then go to the trouble of pointing out why it’s wrong (if it actually is). And at least with the few physics things that Psarris addresses (basic thermodynamics), he needs to show the math. Otherwise, it holds as much weight as me saying that my oven can’t possibly heat up past 500° by itself therefore it contains heat left over from its formation which means it’s young. Otherwise, I hope that at the very least this post will lead you to question the validity of Psarris’ claims. And if you’re already a firm critic of young-Earth creationism, then I hope that I have armed you with more information to stop the spread of bad pseudo astronomy. Making the rounds on the blogs and skeptical websites – including PZ Myers’ Pharyngula blog – is an up-and-coming young-Earth creationist, Spike Psarris and his CreationAstronomy.com website. Now, when I was made aware of this site, I tried to go to it but kept getting 505 errors meaning that they had exceeded the bandwidth they paid for. I’m guessing this was due to PZ’s blog post about it. Well, a few hours later, it was back up and I got to see what the hooplah is about. It’s a guy selling a YEC DVD. He has a free preview on his site – at least at the time of writing this blog – that shows the intro to the DVD and the “chapter” on Jupiter. The title of this blog post is what he claims within the first minute of the Jupiter video segment. The rest of this post will be correcting the errors, half-truths, and misstatements throughout the rest of the 13-minute video. This is where the video stops for me. Even though my player lists the video as being 13 min 28 seconds long, it keeps stopping after 3 min 54 seconds. But, that’s really enough to get a flavor of the video, so let’s get to what’s really going on. Okay, even if you’re a young-Earth creationist, please please PLEASE stop talking about astronomy in terms of “evolution,” “evolutionists,” and “darwinism.” The Theory of Evolution has ABSOLUTELY NOTHING to do with astronomy (unless you are talking about really far down the line things). Natural selection says nothing about how planets form. Punctuated equilibrium has nothing to do with the gases in Jupiter’s atmosphere. Now that I’ve gotten that out … the first big clue as to an alternative agenda (as if that weren’t obvious from the get-go) is relating evolution to astronomy. As if somehow showing that Jupiter’s rotation rate cannot be explained by an outdated model has something to do with the validity of common descent of species. And this is quite telling in this clip because in practically every single sentence, Psarris claims that this has to do with evolution, evolutionary models, or evolutionists. With that said, I will not address the non sequitur “evolution” references in each and every claim when I address them in the next section. First off, I should note that we have known what Jupiter’s rotation rate was as far back as 1835 (since that’s the first paper that I can find on the subject) but I would guess that Galileo was able to estimate its rotation period, as well. For those interested, here is the article from 1835. With that out of the way – we know how fast it’s spinning on its axis – how does it spin so quickly? The preliminary question would be, why does it spin in the first place? This webpage has a pretty good simplified explanation for why objects in the solar system spin, and why they mostly spin in the same counter-clockwise direction (when viewed from the North Pole). The basic one-liner is that the protoplanetary disk was orbiting the protosun in the same direction, and due to the differential rotation within the disk, a net spin was imparted onto any condensing objects. And now we get to the part where the objects spin quickly. This is the classic ice skater analogy: If your spinning on the ice and you have your arms extended, you will spin slowly. If you bring your arms closer to your body, you will spin faster. That is because of the conservation of angular momentum. Now let’s say you put 20-lb lead weights in your hands. If you now bring your arms close to your body, you will spin even faster than before. In other words, the more mass you bring close to the center, the faster you will spin. Jupiter has a lot of mass – the most mass of any object other than the sun in the solar system. It also has the fastest rotation rate. Saturn, the second-most massive planet, has the second-fastest rotation rate. Neptune, which has the third-largest mass, has the third-fastest rotation rate. See a pattern? Now, I’m not sure what “evolutionary model” he’s talking about that predicts a slower rate. He doesn’t cite his source. Regardless, he has not presented any case that anyone should take seriously as to why Jupiter “can’t” spin quickly under an “evolutionary model,” so at best this is an unsupported claim where the burden of proof is solely upon him to at least present reasoning rather than a simple claim. Update since original post: I have now obtained a copy of the paper that Psarris quotes from (Kerr, (1992), “Theoreticians are putting a new spin on the planets,” Science, 258: 5082, p. 548.). This is a very obvious example of a fairly common YEC tactic, quote-mining. This is where they search for a line or two in pretty much any scientific paper/book/press release and use it completely out of context. I can’t go on to quote the paper verbatim because that is not the purpose of this blog post and it is not completely legal (and the paper requires a subscription to the journal in order to read it). But the upshot is that this paper simply describes, in short, two small modifications to the main planetary formation models that can better account for a preferred direction once you consider even more of the real, physical dynamics that occur in a protoplanetary disk. This second claim is at best misleading, at worst just an outright lie. The main composition of Jupiter is H2 (molecular hydrogen) at 89.8% (±2.0%). The secondary element is He at 10.2% (±2.0%). Notice that those two add up to 100%. Now, there is a very little bit of other stuff, but it is what we call “trace,” meaning that there is very very little of it there. The main trace constituents are methane (0.3±0.1%), ammonia (0.026±0.004%), hydrogen dueteride (.0028±0.001%), ethane (0.00058±0.00015%), and water (0.0004% (varies with pressure)). This is data from NASA’s Jupiter Factsheet. Now why are these tiny tiny numbers cause for mention? Well, they do show a relatively significant enhancement over the solar abundance, and Jupiter is supposed to be reasonably like the sun in its composition. But not totally. What I have noticed that creationists commonly fail to realize is that scientists want to make observations that disagree with their theories. But rather than throwing away their theories, they modify them in order to improve the theories so they can explain all of the evidence. That is what has happened since the determinations of the jovian atmospheric composition: It has placed constraints on models of Jupiter’s formation. Rather than make assumptions, we now have legitimate constraints upon parameters, like where in the solar nebula Jupiter may have formed, or where the smaller pieces that combined to form Jupiter may have formed themselves. That is what real science is: Making a model from current observations and then making predictions from that model. If future observations do not match those predictions, then the model must be altered or replaced in order to be able to account for the new observations. We can still build Jupiters in planetary formation models (as opposed to evolution models). We just now have more constraints upon how, where, and from what they form. This claim is fairly silly at this point in time. Before the Galileo probe reached Jupiter in the 1990s, estimates of the size of the core of Jupiter were around 5-15 Earth masses, though the actual value varied considerably based upon what model you used and what you assumed (think back to section 2 above on how science is done). Once Galileo reached Jupiter, it was able to take various measurements and it being in orbit allowed various tracking stations on Earth to record its position — allowing us to create a model of Jupiter’s gravity field. This, along with Jupiter’s moments of inertia, are needed to really constrain models of how big Jupiter’s rocky, solid core may be — or if it even has one. The current state of the science, however, is inconclusive. The measurements from a decade ago were not good enough to conclusively state whether or not Jupiter has a core, and how large it may be. The data generally indicate that the core can be no larger than ~12 Earth masses — a far cry from whatever source Psarris used that said the core can be a maximum of only 3 Earth masses. But, the results from Galileo provide few limits towards the size of the core, and so it is still not well-constrained. One example reference is: Guillot, Gautier, & Hubbard, (1997), “New constraints on the composition of Jupiter from Galileo measurements and interior models” Icarus. Another recent paper (where I use “recent” as meaning 2008) models what Jupiter’s core will be from first principles of physics and comes up with 14-18 ±6 Earth masses, within the range of what Galileo results show. The next claim is that the solar nebula would disappear within 5 million years, but Jupiter takes 10-100 million to form. Obviously a problem! But that’s what happens when you take the extreme numbers on the one hand with the opposite extreme numbers on the other, along with outdated models. Let’s look at the 2004 publication, “Formation of the giant planets,” from 2004. The author clearly states that the protoplanetary disk will dissipate within 1-10 million years. So, yes, the “5 million years” number Psarris quoted is reasonably accurate and jives with the latest science. However, this isn’t a “gotcha” moment for the YECs. It’s not as though they caught us astronomers with our proverbial pants down, that we didn’t realize there’s a contradiction here. We do. And yet again, this simply serves to place further constraints on how planets can form. And new models have come out of it. One example is this model which proposes a diffusive redistribution of water as one of the primary mechanisms for forming Jupiter, and they can form Jupiter’s core within 100,000-1,000,000 years. Or there’s this paper, which forms the gas giants by concurrently accreting both solids and gas (generally thought to accrete separately). It can form Jupiter and Saturn in 1-10 million years. Of particular interest in planet formation, to be honest, is how Uranus and Neptune form. All models require significantly longer timescales for them because they are farther from the sun. The fastest I’ve seen still requires ~2x as much time to form. them as Jupiter and Saturn, but they have to form while there’s still enough of the solar nebula left. The very first line of a 2002 paper by Thommes, Duncan, and Levison states, “The outer giant planets, Uranus and Neptune, pose a challenge to theories of planet formation.” Even though this was written over 8 years ago, it still holds true today. They do pose challenges. But astronomers welcome those challenges as opportunities to learn more about the universe around us rather than throw up our hands and turn to a young-Earth creationist model, which is ultimately what Psarris wants you to do. In general, Psarris is not presenting new arguments. I’ve heard of the last two before, though not the first two. And I can almost guarantee that he uses some of the classic arguments that I’ve addressed before in other sections of his DVD. What’s the bottom-line? He points out apparent observational evidence that seems to conflict with the “evolutionary” picture of Jupiter. The problem with that is astronomers know about these problems – if they are problems at all – and we actually use them rather than ignore them in order to refine models of how Jupiter formed and has changed through time. All because it has 3x more nitrogen than the sun does not mean that astronomers will suddenly throw up their hands in despair and change their views to reflect that of young-Earth creationism. But, for $19, that’s what Psarris is going to try to convince you of.